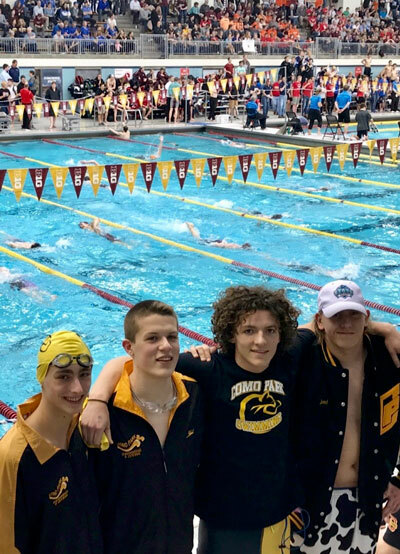 Como swimmers Jared Czech, Noah Frese, Cole Napierala and Josef Miller (from left to right) concluded their season at the state tournament. Here are Eric Erickson’s summaries of winter sports from Como Park Senior High School and Murray Middle School. Boys’ swimming — The Cougars entered the season knowing where they wanted it to end — at the University of Minnesota in the state meet. With most members of the 400 Freestyle Relay team that reached state in 2017 returning to compete this year, the four boys in the top relay team knew it was possible to get there again if they put in the work. The work included practices before and after school, which helped them reach their goal: The Cougars finished the year at state. Along the way, the Como team was deep enough to finish second in the St. Paul City Conference Meet after steady time improvements through the season. Leading the way were seniors Cole Napierala, Jared Czech, Noah Frese and junior Josef Miller. They set a school record in the 200 Medley Relay at the Section 4A meet. Then, after finishing third out of 24 teams in the 400 Freestyle Relay, they qualified for state. Miller also qualified for state as an individual in the 100 Freestyle after placing second in the section. While the Cougars didn’t earn any medals at the state meet, they did trim down their time from sections, a huge point of pride for all those involved in the program. Wrestling — Como started the season strong with wins against city opponents Central and Highland and victories over a couple of Minneapolis teams. The Cougars were challenged in tournaments and had a difficult time through the middle of the season. However, the hardest-working individuals on the team persevered and continued to improve, setting up for a successful Section 4AA Tournament. 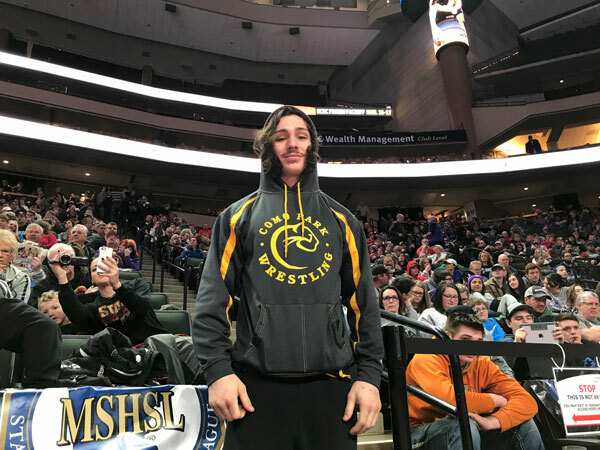 Como wrestling captain Drew Barnard participated in the state wrestling tournament after qualifying with a second-place finish in the 145-pound division of Section 4A. Sophomore Alonte Johnson and junior Gerrick Beasley both medaled in the section, finishing fourth and sixth, respectively, in their weight divisions. Senior Drew Barnard capped off four years of commitment and determined effort by earning second place in the 145-pound division, which qualified him for the state tournament. Barnard’s dream was realized in dramatic style with a takedown of his opponent in the final seconds of the Section 4AA match to determine who would move on to state at the Xcel Energy Center and whose season would end. While Barnard didn’t advance through the brackets at state, he battled the state’s best in his two matches and proudly represented Como on the big stage. Boys’ basketball — The Cougars had an up-and-down season that concluded with more wins in the second half of the schedule. Senior leaders on the team included Malique McCoy, Robert Adams, Tim Simmons, Lukas Walton, Louis Carter, Jevon Bobo, Deahveon Tucker and Jayviar Johnson. Junior Donn Ward led the team in scoring with 16.5 points a game. Coach John Robinson continued to prioritize academic accountability for all players in the program. The varsity and junior varsity teams had the thrill of playing a game at the Target Center on the home floor of the NBA’s Timberwolves in a special interstate match-up versus a team from Council Bluffs, Iowa. Nordic skiing — The boys’ and girls’ teams kept working through weather challenges all season. From dry-land training, to snow with crazy cold temperatures, the practice routine was uneven and difficult to manage. Yet the Cougars carried on with organized coaching and strong senior leadership resulting in growth and meaningful experiences. Participation levels were high with just over 30 skiers in the program. Senior leaders included Eva Hanson, Eli Pattison, Gabriel Reynolds, Dominic Wolters, Earl Eldridge and Lucas Carmichael-Tanaka. At the conference meet, junior Antero Sivula and eighthgrader Saylor Landrum earned all-conference honorable mention for their team-leading times. Girls’ basketball — For the fourth consecutive season, the Cougars claimed the St. Paul City Conference championship and the Twin Cities Sports to 20 title in girls’ basketball. In conference play, the Cougars went undefeated and extended their conference winning streak to 40 games. They defeated the Minneapolis champion, South High School, in the Twin Cities game, keeping bragging rights in St. Paul for another year. The Cougars overall record was 19-9. They advanced to the Section 4AAA semifinals before losing to the No. 1 seed Mahtomedi. Senior Makayla Van Nett surpassed 2,000 points for her career, an extraordinary achievement to top off her Como career. Seniors Raiyne Adams, Autumn Tucker, Don’nikka Patterson and Zarina Sementelli all played significant roles in leading the Cougars to their titles. Every one of the five seniors have been accepted into college and four of the girls are planning to play basketball at the next level. Girls’ hockey — As previously reported in the Bugle, the St. Paul Blades are the cooperative hockey team for St. Paul Public Schools. The team was extremely young, but leadership from the few upperclassmen helped the team come together to have a fun and rewarding season. Senior goalie Taylor Nelson recorded victories for the Blades against Rochester Century and Mankato East/Loyola. She also kept the Blades competitive in many other games. Junior captain Gigi Gabrielli was the Blades’ leading scorer with 14 goals. Senior captain Eliza Donnelly and junior captain Grace Dodge were tireless workers who added scoring punch and solid defending. The Blades moved into their new full-time home at Oscar Johnson Arena, which is an asset the program is excited to use in the upcoming years. Gymnastics — The Cougars were young and competed against much more experienced gymnasts in meets this year. Going forward, the youth can continue to develop and gain confidence. New participants are always encouraged, especially with the summer training programs that are planned. Victoria Hartwich- Cedillo and Wynter Cross were the leading point producers for the team this season. Murray Pilots Wrestling — Of 19 wrestlers on the Pilots’ team this season, only seven had previous experience in wrestling. Maintaining a top-tier finish in the conference seemed like a tall task, but the Pilots proved to be quick learners who worked extremely hard to earn third place in the city out of eight teams. Twelve Murray wrestlers placed in the top four at the conference tournament. St. Paul City titles were earned by Believe Mihigo, Julei Hei, Sergio Newell and Justice Deloach. Royal Lee and Mitchell Straw took second place in their weight classes. Coach Kirby Scull said it is a lot of fun to work with student athletes that put in such great effort and strive to improve. Wrestling — Of 19 wrestlers on the Pilots’ team this season, only seven had previous experience in wrestling. Maintaining a top-tier finish in the conference seemed like a tall task, but the Pilots proved to be quick learners who worked extremely hard to earn third place in the city out of eight teams. Twelve Murray wrestlers placed in the top four at the conference tournament. St. Paul City titles were earned by Believe Mihigo, Julei Hei, Sergio Newell and Justice Deloach. Royal Lee and Mitchell Straw took second place in their weight classes. Coach Kirby Scull said it is a lot of fun to work with student athletes that put in such great effort and strive to improve. Girls’ basketball — The Pilots put together another strong season in the middle school division of the St. Paul City Conference. After winning the last couple of conference championships, this year’s team was challenged by having three of the top eighth-graders play up with the Como varsity team. Despite that situation, the girls who represented Murray on the court did a great job of coming together, working hard and using their skills to finish 9-2, which was good for a third-place finish out of the 12 schools that field girls’ basketball in the city. Boys’ basketball — A mix of returning and new players for the Murray boys took some time to develop as a unit. After a 2-2 start that included losses to Ramsey and Highland (who sit at the top of the standings), steady growth occurred for the Pilots as they piled up seven consecutive wins to conclude their regular season with a record of 9-2 in the St. Paul City Conference. As the Bugle went to press, the team was scheduled to play in the conference third-place game versus Parkway. Spring sports — Murray baseball, softball, badminton and track begin practice on April 9.